​ ​SAN ANTONIO – The area housing market showed no signs of cooling in October 2017 with sales and prices keeping a record-setting pace. Just over 2,500 homes were sold in the San Antonio metro area last month, a 4.5 percent increase from October 2016, according to data released by the San Antonio Board of Realtors. The total number of homes sold so far in 2017 stands at 25,961, which is 3.8 percent above the total for the same period in 2016. The market is set to surpass last year's 29,545 home sales. The median price of a home in the local area was $207,100, 2.4 percent above the median in October 2016. 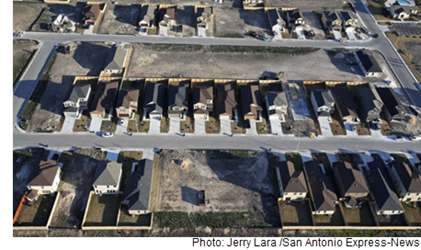 Local home prices have surged in recent years as San Antonio’s growing population pushes up demand and developers grapple with a shortage of construction workers. ​​Also, check out San Antonio-New Braunfels Housing Market Research.